First off, it is big. It has a seven-foot diameter glass surface and while there are certainly bigger multitouch walls out there, few match our resolution at 2560 x 2560 pixels (better than HD) or if they do, they often aren’t contiguous. Many walls are made up of a number of separate panels or cells. Also, our wall is round, which by itself makes this an unusual installation. Additionally, the fact that this exhibit is permanent (many other walls are temporary) presented challenges along the way, as we used thick tempered glass and other hardened materials to build the wall. 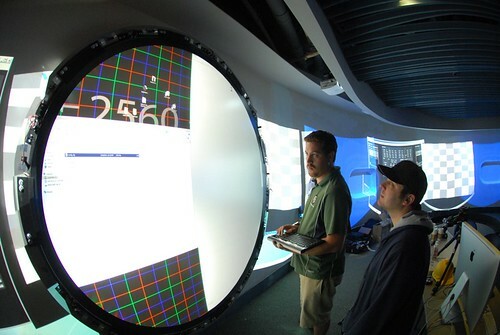 The exhibit can track an almost unlimited number of points (hundreds) allowing for multiple visitors to interact simultaneously. We used a series of low-powered 5 milliwatt lasers successfully to provide the infrared light for the tracking. The exhibit has a relatively simple four camera system to capture the touch points. The software and beautiful 3D plankton models were created by Lindsay Digital using Unity. The group at the Monterey Bay Aquarium developed the concept and put together the team. If you haven’t read them already, there are a series of posts on the development of this exhibit. See Building a Multitouch Wall Part 5 and you can work your way through the series. There’s information about all our partners on the project, the equipment used, and the design and engineering challenges we faced. As always, we welcome your feedback and questions. The photo courtesy of Lindsay Digital. The video was shot by the Monterey Bay Aquarium. Category: Design, Exhibits, Multi-touch, Multitouch.